Sign in to HPE Support Center with your HPE Passport ID. If you do not have one, click Create an account below the Sign in button and follow the instructions. Images in this help are thumbnails. Click a thumbnail to expand it. Click it again to reduce it to a thumbnail. Only one image can be expanded at a time. You must reduce an expanded image before you can expand another one. You can search the help or navigate using the topic groups at the left or across the top. Note you can also find these HPE Support Center features by typing their name into the search box and selecting them in the suggested results. Search is on the initial page after you sign in. Search provides access to documentation, drivers, and other software for most HPE products. See Product search for details. Enter serial number information to retrieve warranty status on your products, including service type and level, coverage dates, deliverables, and other details associated with the warranty. See Warranty check for details. Submit and manage support cases for hardware and software products using a serial number, a valid warranty, packaged support or support agreement. See Support Case Manager for details. Manage your entitlement and get access to entitled HPE Support Center features. You can link support agreements, packaged support and warranties to your profile, and share entitlement with other users. See My contracts and warranties for details. 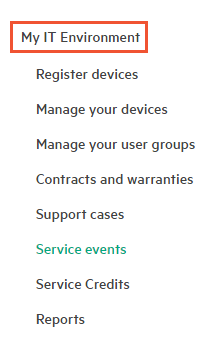 Service events generated and reported to HPE by remotely supported devices. Support cases associated with your HPE Passport ID. Contracts and warranties associated with your HPE Passport ID, or shared with you by other users. Service Credits, which allows you to view Proactive Service Credits you have purchased, and services exchanged and available for those credits. See My IT Environment for details. HPE Authorized Channel Partners can also use the My Customers area to manage the devices of customers who choose to have this done for them. See My Customers for details. Lists the three most recent Top Resolutions documents. Click the document's title to view the document. The document will open in the browser if the file type can be viewed in a browser, otherwise you will be prompted to download the document. If there are more than three top resolutions, click See more Top Resolutions to show all Top Resolutions across all products. For help with signing in, registration, or site navigation, contact the HPE Support Center usage support team. For more support options, see Support resources. This Help also includes a Glossary of common terms used in the HPE Support Center. For certain products, you must have the right privilege to access downloads, knowledge and tools. See Entitled content access for more information.